AM Radio Signal Booster – The RadioLabs AN200 AM Antenna is a beautifully designed loop antenna for enhanced AM or Medium Wave reception. 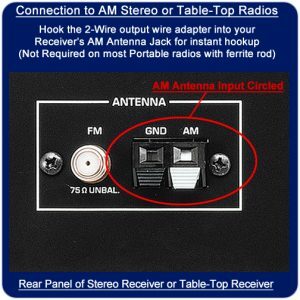 The antenna instantly and dramatically boosts the AM reception of any portable radio, home stereo receiver or table top radio, by simply placing the antenna near your radio and tuning it, or, with this model, allows you to hard-wire the antenna to your home stereo receiver or table top radio with twin lead attachment. Amazing signal clarity and makes distant stations instantly sound like they’re local! 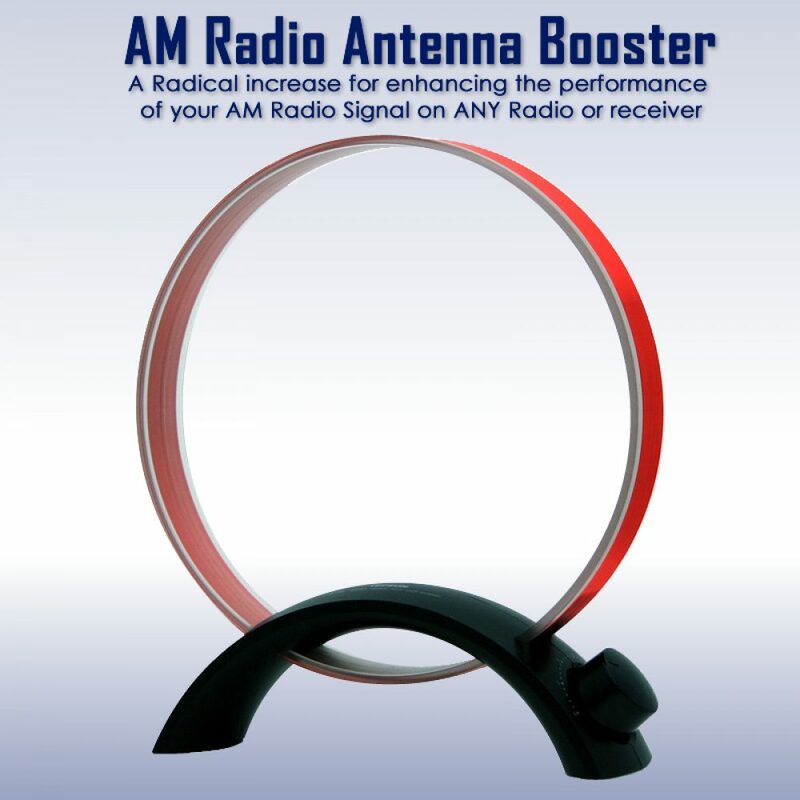 Boost your Radio’s AM Reception with this Amazing antenna! The RadioLabs AN200 booster is a directional AM Radio Antenna, capable of pulling in distant stations and increasing your radio’s signal. Antenna points towards the AM Radio Station you’re trying to listen to. All stations to the side of the antenna are heavily attenuated or suppressed. The AN200 features a built-in tuning dial that allows tuning to the appropriate station and the selectivity to block out unwanted stations and noise; which without the antenna would crowd or “bleed” into the desired signal. The antenna can also be adjusted by physically turning the loop in the direction of the station’s broadcast and pointing it directly at the station. One of the great things about this antenna is the possibilities available by selective tuning, loop adjustment and radio dialing. 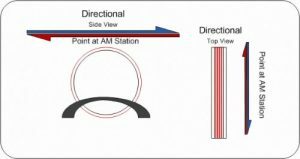 The AN200 AM Loop Antenna will give you an added dimension to your AM radio by giving you better reception of the stations you already get, clearer sound, improved clarity and enhancement of stations that would otherwise be drowned out. Receiving long distance AM Radio stations is easy with the AN200 (NO power requirements) tuned coil antenna, boosting AM Performance beyond above what you think is possible. Simply placing it next to the portable radio’s internal AM rod antenna or by connecting it to larger desktop radios that have AM antenna terminals by using the included 1/8″ to bare wire cable. Why is my AM Radio Reception weak? Radio Noise and Sensitivity. However, the antenna inside of a portable radio however is the device which is responsible for picking up the radio station. These internal antennas are usually very small, very weak, and are often forgotten. Most people think that the whip antenna is the device receiving the signal, when in fact has no affect on receiving AM. 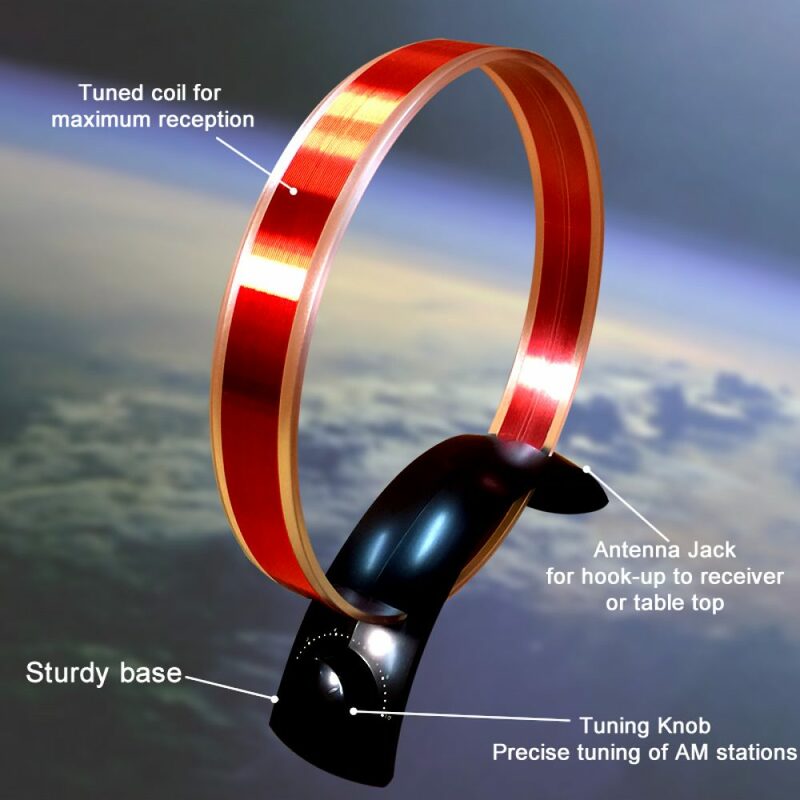 This remarkable AM Radio antenna, works by combining a capacitor, along with a large air coil, to fine tune to a specific band. When you slowly rotate to adjust the tuning knob, the capacitor, in conjunction with the air coil, combine to radically boost the signal of the weak station you are trying to listen to. The antenna creates a “Field” around the antenna and when placed next to your portable AM Radio and the radio is place close to the AN200 AM Radio Antenna, a significant jump in received signal strength is instantly noticed. This field effect on the radio very similar to “Sympathetic Resonance”, just like placing 2 guitars on a table right next to each other. When you pluck the string on one guitar, the other guitar’s same string starts to resonate, but this happens with a radio signal, on your ferrite rod antenna. Sometimes this tuning effect on the radio’s reception is so great, that people often think it’s some type of magic or voodoo.. With no wires attached to the portable radio, you just simply tune the knob and BOOM! a HUGE boost the station’s signal. For people seeing this for the first time, it’s really quite remarkable. acceptable. These antennas generally plug into two connections on the back of the receiver or Table-Top radios. These dual clips are called “Twin Lead” connections and are the only inputs available for AM Radio reception on a home stereo or table top. The reception is generally very poor with these stock receiver’s open air loop antenna, but at least you can receive something. The AN200 model antenna is capable of either sitting directly next to this open air loop, or, you have the option with this model antenna, to plug the 1/8th inch plug with wire into the front of the AM Antenna, then running the 2-wire output directly to the clip leads on the back of the Home Stereo receiver or Table top radio. The antenna plugs are always labeled “AM Antenna” or something similar. The AN200 AM Radio antenna’s twin lead wires will not be required on most portable radios. Once the twin lead adapter is plugged into the rear clip leads for AM, the antenna can then be tuned to “Peak out” the tuning, then rotated towards the AM Radio Station and Null out, or decrease any potential interference. Once properly tuned and rotated, a TREMENDOUS increase in AM Radio Reception will be noticed and you will have excellent reception on your Home Stereo or Table Top receiver. The increase is so dramatic, if you haven’t experienced this before, you’re in for a surprise. People often hear this increase for the first time and wonder where this device has been their whole life, because it will take a station that is barely audible in the background, with horrible static, adjacent channel interference and inaudible muddled audio, and instantly bring these stations in so well, you’d think it was local. RadioLabs amazing, high power, long range USB WiFi card, can capture signals that all other cards simply cannot see. We are excited to offer the Wave Plus, which is the latest addition to our high performance USB WiFi adapter line. Using the latest IEEE standard, this adapter is rugged and compact, capable of achieving up to 150Mbps. Solid Aluminum CNC construction, chipset cooling, and incredible wifi long range performance give you the best wifi range, signal strength and boost your computer’s signal to distances other copycat cards only dream of. RadioLabs popular Sangean ATS-909X – ClearMod , is a modified version of the new Sangean ATS-909X, providing both increased clarity and sensitivity. Our amazing filter modifications, performed by skilled technicians, significantly reduces noise, static and adjacent channel splatter. While the 909X is already a very sensitive receiver, our custom receiver modification takes the AM & SW bands and supercharges them for greatly improved worldband and AM performance. The New Sangean portable receiver, made specifically for the person, who wants full coverage AM/FM shortwave and world band full coverage, but does not need advanced features like single sideband. Small portable at a GREAT price! Excellent quality earbuds, with great audio, retention and soft on the ear. These earphones were designed for long term wear, nighttime listening and sound just as good on shortwave and AM radio as they do high quality Rock and Roll. Sturdy housing and right-angle shaft, sits at the perfect angle to not cause tension. Cord will not tangle, and is made out of soft flexible rubber. Will not wrap up or crimp. Audio response is amazing and excellent bass response. This incredible little AM Radio Antenna, drastically boosts the signal strength, reduces noise and improves reception on any portable AM Radio. No wires, no batteries and no gimmicks, this antenna works miracles. Using World War 1 technology, this AM signal booster, creates a huge radio signal field around the outside of the antenna, substantially improving the reception, decreases static and eliminates noise on any portable receiver near it. Simply setting this antenna behind the radio and tuning the knob gives a 200-500% increase on most portable receivers.